Well, it had to happen. After not reading a book I didn’t like in all of October, barely a week into November and I found one that did nothing for me. And I’m even more disappointed because I had high hopes. 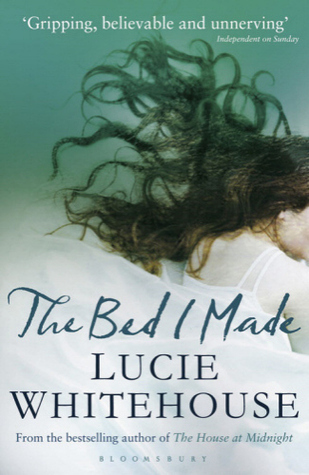 The reason, I had read Lucie Whitehouse’s Before We Met earlier this year and really liked it – the pace, the plotting, and the characters – and had hoped for more of the same. Sadly, it was not to be. The Bed I Made is slow from start to finish, only picking up the pace in the last 60 or so pages, way too late for me to care I’m afraid. Lucie Whitehouse tries, and early on nearly succeeds in building up the tension, creating a career girl (Kate) who meets a too perfect man (Richard), only to discover he isn’t anywhere near what she thinks he is. I spent the first few chapters wanting to know just what Richard was up to and why. The problem is that once Kate figures it out and heads to a bolt hole all Richard has is email and text. It just doesn’t a good bad guy make. I needed more. I needed twists, turns, and danger. Not Kate being mildly concerned but – inexplicably to me – unable to tell her best friend why. All that said, and disappointments aired, this isn’t a badly written book. Lucie Whitehouse does a good job setting the scene and describing the island Kate has retreated to and the people who inhabit it. She has a nice, easy to read style, that keeps you turning pages. It is a shame the story didn’t do the same – meaning (no surprise) this one wasn’t for me…sorry! Ah, too bad…I enjoyed Before We Met, so I had plans to read this one. I think I’ll pass now. Thanks for sharing. I am the same. I try and make it to the end of most books. And this one I could. It just lacked oomph. I don’t know if I’d read any more of her books for a while.